Keith Marsden's case was probably the strangest example of the rumoured `special relationship' between Chesterfield and Manchester City concerning post-war transfers. Under the rumoured terms of any such relationship, the Spireites were supposed to be offered any City player surplus to requirements at Maine Road, but still with something to offer, while City got first refusal on any player of promise at the Rec. The likes of Ron Powell and George Smith fitted into that first description, and Keith Marsden was certainly one of the second. 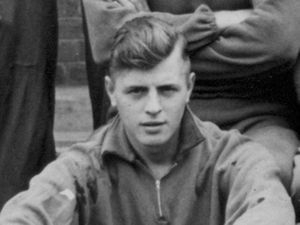 Having first joined the club in November 1951 from youth football in Youlgreave, Keith signed pro forms in June of 1952 but National service denied Chesterfield free use of him for almost all of his time at Saltergate. When he did play, though, it was clear that he was a richly talented individual, energetic, powerful and imposing. His prolific return from a stop-start career led City to offer a biggish fee in July 1955 - £6250 for a lad with only 22 League games under his belt. Chesterfield's directors may have been concerned about adverse reaction to the move, though, for Keith's transfer went unreported in the local media. Despite his scoring record at Saltergate, City chose to convert him to defence, but injury denied him the opportunity to claim a regular place. When he was included, the City staff saw some ball-playing ability, although an attempt to play Keith in an early sweeper role was not a conspicuous success; the first two games after unveiling the "Marden Plan" saw City lose 6-1 and 9-2! The plan was dropped and Keith never played for City again. Keith signed for Accrington in July 1959 but injury prevented his ever playing for them. Leaving football behind, Keith ran the Empress Cabaret Club, in Stockport, from December 1959. Sadly, Keith was killed in a car crash in South Africa in 1986. For Chesterfield: 22 Football League appearances, 15 goals.